Nemo me impune lacessit was the Latin motto of the Royal Stuart dynasty of Scotland from at least the reign of James VI when it appeared on the reverse side of merk coins minted in 1578 and 1580. It is the adopted motto of the Order of the Thistle and of three Scottish regiments of the British Army. The motto also appears, in conjunction with the collar of the Order of the Thistle, in later versions of the Royal coat of arms of the Kingdom of Scotland and subsequently in the version of the Royal coat of arms of the United Kingdom used in Scotland. It means No one "cuts" (attacks/assails) me with impunity, and has been loosely rendered in Scots as Wha daur meddle wi' me? (in Scottish Gaelic Cha togar m' fhearg gun dìoladh, pronounced [xa ˈt̪okəɾ ˈmɛɾak kuɲ ˈtʲiəl̪ˠəɣ] ( listen)). It is also alternatively translated into English as No one can harm me unpunished. According to legend, the "guardian thistle" (see Scotch thistle) played a vital part in Alexander III, King of Scots' defence of the ancient realm of Scotland against a night-time raiding party of Norwegian Vikings, prior to the Battle of Largs (1263): one or more raiders let out a yell of pain when stepping on a prickly thistle, thus alerting the Scots. 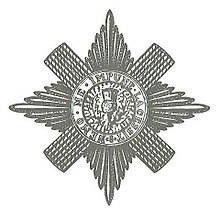 In the motto "No one harasses me with impunity" (Latin: "Nemo me impune lacessit"), "me" was therefore originally the thistle itself, but by extension now refers to the Scottish regiments which have adopted it. The modern form of the motto was used by Francesco I, Duke of Milan and had been used in Britain on the colours of the Scottish Royalist officer John Urry during the English Civil War. It was also used by the Parliamentarian propagandist Marchamont Nedham as the motto for his newsletters. Another traditional source appears in the form of a Scots proverb, "Ye maunna tramp on the Scotch thistle, laddie", this being immortalised in marble by Glasgow monumental sculptors James Gibson & Co. for the Kelvingrove International Exhibition of 1888. The phrase "Wha daur meddle wi' me?" also appears in a traditional border ballad entitled "Little Jock Elliot", which recalls the exploits of a 16th-century Border Reiver ("John Elliot of the Park"), with particular reference to an infamous encounter in the summer of 1566 with James Hepburn, 4th Earl of Bothwell, the third husband of Mary, Queen of Scots. The French city of Nancy has a similar motto, Non inultus premor ("I cannot be touched unavenged"), also a reference to the thistle, which is the symbol of the region of Lorraine. The motto of the Most Ancient and Most Noble Order of the Thistle, the Scottish chivalrous order, is also that of the British Army regiments The Royal Regiment of Scotland, Scots Guards and Royal Scots Dragoon Guards. It was also the motto of several former units of the British Army, including the Royal Scots, Royal Scots Greys, Royal Highland Fusiliers and Black Watch, some of which went on to be amalgamated to form the Royal Regiment of Scotland in 2006. The motto is also that of the Royal Company of Archers and has been displayed upon the unit's second standard since 1713, following the grant of a Royal charter by Queen Anne. During the reign of Charles II, the motto, appearing on a scroll under the shield and overlying the compartment, was added to the Royal coat of arms of Scotland, as displayed in relief above the entrance to Holyrood Palace. Since 1707 it has appeared in the Scottish version of the arms of British Monarchs, including the present Royal coat of arms of the United Kingdom used in Scotland. The motto appears in conjunction with the collar of the Order of the Thistle, which is placed around the shield. (The collar of the order appears in earlier versions of the Royal coat of arms of Scotland, but without the order motto). The motto of the Order of the Thistle (Nemo me impune lacessit) should not be confused with the motto of the Royal arms (In Defens), which appears on an escroll above the crest in the tradition of Scottish heraldry. (In Defens being an abbreviated form of the full motto In My Defens God Me Defend). Nemo me impune lacessit is displayed prominently above the Gatehouse entrance added to Edinburgh Castle in 1888. Cap badge of The Black Watch (Royal Highland Regiment) of Canada. Armed forces units elsewhere have also adopted this historic motto. In Australia, members of Heavy Weapons Platoon (DFSW) of the 3rd battalion (PARA) Royal Australian Regiment proudly use this motto as a symbol of platoon brotherhood and bonds forged in service together, the motto was also used by the Victoria Scottish Regiment, which subsequently became 5th Battalion Royal Victoria Regiment (RVR) which now forms one of the rifle companies of the RVR. (The motto is also used by the RVR Pipes and Drums Association). The Black Watch (Royal Highland Regiment) of Canada, a reserve infantry regiment of the Canadian Forces, also bears this motto. (The motto appearing upon the regimental cap badge). The motto is also that of the Cape Town Highlanders Regiment, a reserve mechanised infantry unit of South African Army. The Caledonian Railway used the motto as part of its crest, until "grouped" into the London, Midland and Scottish railway in 1923. The motto (with the verb in the Future Tense [lacesset]: "Nemo Me Impune Lacesset") appears as a reverse inscription on the Scottish "Bawbee" (6 pence) coin of King Charles II surrounding a crowned thistle. Examples exist for 1677, 1678 and 1679. The coin is scarce but not considered rare. This coin is of copper, and was later revalued as a half penny. The motto appears as an inscription on the rim of both the 1984 (& 1989) "Thistle and royal diadem" and the 1994 (& 1999) "Lion rampant" designs of the "Scottish" themed editions of the British one pound coin - and again on the rim of one of two new "floral" designs for 2014. Union College, University of Queensland, Australia, also adopted the motto. The motto also appears on the back collar of Edinburgh Rugby official kit. In Belgium, the 1st Squadron (Belgium) of the Belgian Air Force bears the motto. The motto was also used by the Italian noble family Malacrida, of Como. Wilhelm II, German Emperor used the motto in a telegram to Foreign Minister Bernhard von Bülow on November 7th 1897 following the Kiautschou Bay concession, arguing that Chinese aggression towards Catholic missionaries will no longer be tolerated, and will be met with swift military action. The 1st Battalion, 24th Marines of the United States Marine Corps uses the phrase as its motto. It is also referenced in the Edgar Allan Poe story "The Cask of Amontillado" (Poe was adopted by a Scottish merchant), and in Stanislaw Lem's Fiasco. The motto also appears (with the verb in the Future Tense: Nemo Me Impune Lacesset) above an American timber rattlesnake on a 1778 $20 bill from Georgia as an early example of the colonial use of the coiled rattlesnake symbol, which later became famous on the Gadsden flag. 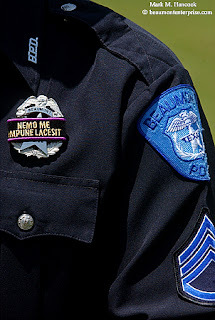 The phrase also appears on mourning bands worn over the badges of law enforcement officers in the United States. Nemo me impune lacessit is the motto of Dartmouth College's independent conservative newspaper, The Dartmouth Review. This phrase is also one of several intimidating phrases (all in Latin) that are spoken by opponents in the mobile game Blood and Glory, published by Glu, which involves gladiator combat. "The Cask of Amontillado", a short story by Edgar Allan Poe, in which Nemo me impune lacessit is the family motto of the character Montresor. Mortal Causes, a 1994 novel by Ian Rankin, in which the motto is a clue in solving a young man's murder. Noli me tangere – "touch me not"
^ Numismatology article in The Popular Encyclopedia. 1841. Retrieved 17 August 2014. ^ Historic UK. "The Thistle - National Emblem of Scotland". Historic UK. Retrieved 8 June 2016. ^ Ian Gentles, "The Iconography of Revolution: England 1642–1649", in Soldiers, Writers and Statesmen of the English Revolution, edited by Ian Gentles, John Morrill & Blair Worden, pp. 91–113 (Cambridge: Cambridge University Press, 1998) p. 100. ^ Ian Gentles, The Iconography of Revolution: England 1642–1649, p. 100, note 34. ^ Tim Gardner - Webmaster. "Glasgow - City of Sculpture, by Gary Nisbet". Glasgowsculpture.com. Retrieved 29 July 2014. ^ "Lord Bothwell". Lord Bothwell. Archived from the original on 12 April 2013. Retrieved 29 July 2014. ^ "International Civic Heraldry". Ngw.nl. Retrieved 29 July 2014. ^ "Image". Retrieved 29 July 2014. ^ "One Pound Coin - The Royal Mint". ^ Cut Armorial Bookplate on: John Gother, "The Key of Heaven or, A Posey on Prayers, Selected from Catholic Authors" (Keating, Brown and Keating, 1815). ^ "Welcome to NEMO Arms - NEMO Arms". nemoarms.com. ^ "Loading site please wait..." proofresearch.com. ^ Lem, Stanislaw (1986). Fiasco. Harcourt Brace Jovanovich, Inc. pp. 222, 227, 273, 290. ISBN 0-15-630630-1. ^ "Funeral Badge" (JPG). Retrieved 1 April 2009. ^ July 29, 2014 5:17 am. "The Dartmouth Review". Dartreview.com. Retrieved 29 July 2014. The royal coat of arms of the United Kingdom, or the Royal Arms for short, is the official coat of arms of the British monarch, currently Queen Elizabeth II. These arms are used by the Queen in her official capacity as monarch of the United Kingdom. Variants of the Royal Arms are used by other members of the British royal family; and by the British Government in connection with the administration and government of the country. In Scotland, there exists a separate version of the Royal Arms, a variant of which is used by the Scotland Office. The arms in banner form serve as basis for the monarch's official flag, known as the Royal Standard. Noli me tangere is the Latin version of a phrase spoken, according to John 20:17, by Jesus to Mary Magdalene when she recognized him after his resurrection. The biblical scene gave birth to a long series of depictions in Christian art from Late Antiquity to the present. The original Koine Greek phrase, Μή μου ἅπτου, is better represented in translation as "cease holding on to me" or "stop clinging to me", i.e. an ongoing action, not one done in a single moment. The Most Ancient and Most Noble Order of the Thistle is an order of chivalry associated with Scotland. The current version of the Order was founded in 1687 by King James VII of Scotland who asserted that he was reviving an earlier Order. The Order consists of the Sovereign and sixteen Knights and Ladies, as well as certain "extra" knights. The Sovereign alone grants membership of the Order; he or she is not advised by the Government, as occurs with most other Orders. 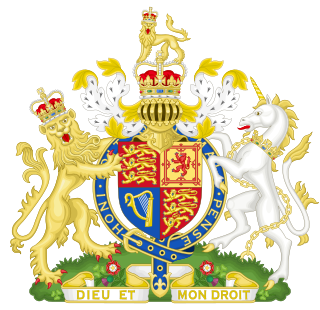 Dieu et mon droit, meaning "God and my right", is the motto of the Monarch of the United Kingdom outside Scotland. It appears on a scroll beneath the shield of the version of the coat of arms of the United Kingdom. The motto is said to have first been used by Richard I (1157–1199) as a battle cry and presumed to be a reference to his French ancestry and the divine right of the Monarch to govern. It was adopted as the royal motto of England by King Henry V (1386–1422) with the phrase "and my right" referring to his claim by descent to the French crown. The Honours of Scotland, also known as the Scottish Regalia and the Scottish Crown Jewels, dating from the fifteenth and sixteenth centuries, are the oldest surviving set of crown jewels in the British Isles. Honi soit qui mal y pense is a French maxim used as the motto of the British chivalric Order of the Garter. It is translated as "May he be shamed who thinks badly of it" or "Shame be to him who thinks evil of it" or "Evil be to him that evil thinks." In contemporary French usage, it is usually used to insinuate the presence of hidden agendas or conflicts of interest. The first coat of arms of Montreal was designed by Jacques Viger, the first mayor of Montreal, and adopted in 1833 by the city councillors. Modifications were made some one hundred five years later and adopted on 21 March 1938, and again on 13 September 2017, resulting in the version currently in use. The coat of arms was the only city emblem representing Montreal until 1981, when a stylized logo was developed for common daily use, reserving the coat of arms for ceremonial occasions. Thistle is the common name of a group of flowering plants characterised by leaves with sharp prickles on the margins, mostly in the family Asteraceae. Prickles occur all over the plant – on the stem and flat parts of leaves. They are an adaptation that protects the plant from being eaten by herbivores. Typically, an involucre with a clasping shape of a cup or urn subtends each of a thistle's flowerheads. The royal arms of Scotland is the official coat of arms of the King of Scots first adopted in the 12th century. With the Union of the Crowns in 1603, James VI inherited the thrones of England and Ireland and thus his arms in Scotland were now quartered with the arms of England with an additional quarter for Ireland also added. Though the kingdoms of England and Scotland would share the same monarch, the distinction in heraldry used in both kingdoms was maintained. 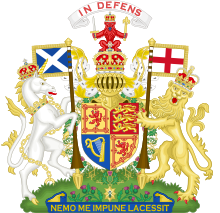 When the kingdoms of Scotland and England were united under the Acts of Union 1707 to form the United Kingdom of Great Britain, no single arms were created and instead, the royal arms as used in either Scotland and the rest of the United Kingdom would continue to differ. Xewkija is a village on Gozo Island, Malta. The population of Xewkija is 3,300 as of March 2014, which is the fourth largest in Gozo, after Victoria (6,901), Xagħra (4,886) and Nadur (4,509). A bawbee was a Scottish halfpenny. The word means a debased copper coin, valued at six pence Scots, issued from the reign of James V of Scotland to the reign of William II of Scotland. They were hammered until 1677, when they were produced upon screw presses. The Royal Regiment of Scotland is the senior and only Scottish line infantry regiment of the British Army Infantry. It consists of four regular and two reserve battalions, plus an incremental company, each formerly an individual regiment. However, each battalion maintains its former regimental pipes and drums to carry on the traditions of their antecedent regiments. 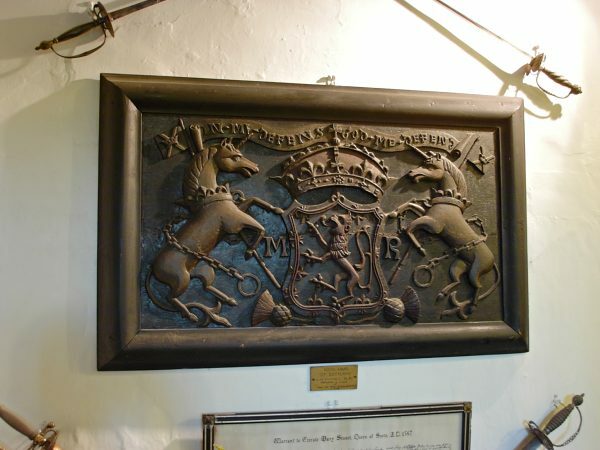 In my defens God me defend is the motto of both the Royal coat of arms of the Kingdom of Scotland and Royal coat of arms of the United Kingdom used in Scotland. Contemporary versions of the Royal arms show an abbreviated motto, in the form of IN DEFENS or, where English is used as an alternative, IN DEFENCE. The motto appears above the crest of the arms, in the tradition of Scottish heraldry. The Knights of Cardone were a Medieval order of chivalry. They are noted for their role in the Siege of Negroponte (1470). Under the Venetian command of Admiral Pierre d'Aubusson the Knights of Cardone prepared for battle against Ottoman forces led by Mehmed II. Unfortunately Venetian General Nicolo da Canale lost his nerve and ordered d'Aubusson to retreat which resulted in the loss of Negroponte, and the island of Euboea. Subsequently, during the Siege of Rhodes (1480), d'Aubusson and his Knights successfully defended against another Ottoman attack by Mehmed II. The Jacobite Royal Scots, sometimes called the Royal-Ecossais, Lord John Drummond's Regiment or French Royal Scots, was a French military regiment made up mostly of Scottish exiles. Formed in 1744 under a 1743 order, they are perhaps best known for serving in Scotland during the Jacobite rising of 1745.